MaxxHaul Headache Rack, model 70234, commercial grade steel, extension on uprights, extends from 62" to 74" wide to fit most pick up trucks, 2" wire screen, no drill installation, inspected, new. 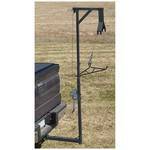 Deluxe 360 Degree Swivel Game Lift System, fits 2" receiver hitch, manual crank winch, 300-lb. lift rating, tubular steel construction, 6'6"h, inspected, new. 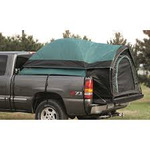 Compact Truck Tent, polyester, water resistant coating, 4.75' of headroom, D-shaped door, polyethylene flooring, mesh windows, fits truck beds 72-74", sleeps 2, not fully inspected, slight use. Full Size Truck Tent, 190T polyester shell, water resistant coating, large interior area with 5.25' of headroom, large D-shaped door, polyethylene flooring, mesh ventilation windows, fits most full sized truck beds 79-81", sleeps 2, looks new, not fully inspected. 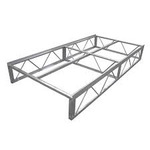 Pair of (2)Patriot 4x8' AluminumTruss Frames, truss frame is an unassembled dock section, goes together easily, hardware included, makes a 4x16' dock section frame, like new.